Torben Möger Pedersen, CEO of Danish pension fund PensionDanmark, has been appointed new chairman of the CBS Board of Directors. Lilian Mogensen, former CEO of Payment Denmark, is new member of the Board. Photomontage CBS. Photo: Ursula Bach (left) and ATP. 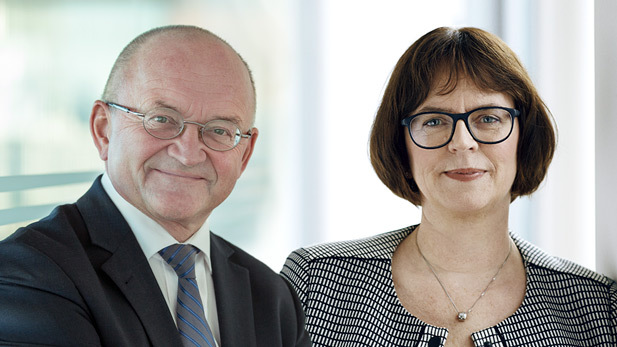 The appointment of Torben Möger Pedersen and Lilian Mogensen will bring considerable experience into the board room at CBS. Torben Möger Pedersen, CEO of the Danish pension fund PensionDanmark, will be the new chairman of the CBS Board of Directors. He will replace Karsten Dybvad, who is to retire from the CBS Board after the expiry of his term of office on 30 June 2019. Torben Möger Pedersen has been the CEO of Denmark’s largest pension fund for 25 years. The pension fund has been named Europe’s best pension fund four times, administers more than DKK 240 billions and has implemented the UN’s Sustainable Development Goals as their fundamental values. Torben Möger Pedersen has extensive experience from current memberships on the boards of Arbejdernes Landsbank, The Danish Rheumatism Association, The Symbion Foundation, Gefion Gymnasium, The Danish Foreign Policy Society, Insurance & Pension Denmark and Aalborg University. He will retire as deputy chair from the latter due to his new position as chairman of the CBS Board. He has deep knowledge of CBS through his position as chairman of The Danish Society for Education and Business (DSEB), which established CBS back in 1917. He is teaching the board programme at CBS Executive and is also adjunct professor at CBS. At the same time, Lilian Mogensen has been appointed new member of the CBS Board. She will replace Lisbet Thyge Frandsen, who stepped down from the CBS Board in 2018. Lilian Mogensen is former CEO of ATP/CEO of Payment Denmark, a consultant and a professional board member with focus on digital transformation, HR and strategy. One of her memberships was on the board of the IT University of Copenhagen for 12 years. Lilian Mogensen takes on the position immediately. For press contact click here. Read more about The CBS Board of Directors here.